spring pastels look pretty fresh this season. designers have ditched pastel grounded florals and dainty details for super textures and ice cream colors. 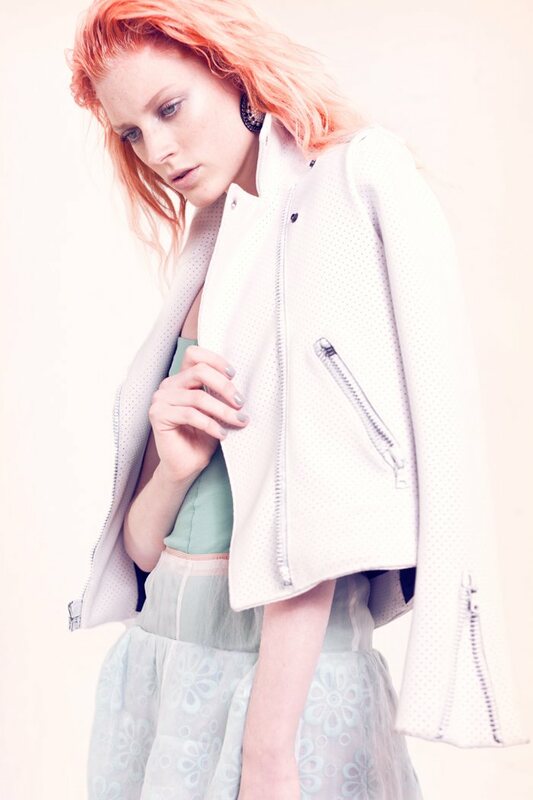 ornate buttons and leather moto jackets give softness a sharp edge. styling this season is ice cream parlor inspired too…soft colored scoops sit stacked one on top of the other for a subtle color blocked look. i mentioned before that mint was a pretty hot color this season. my favorite is the chanel jacket in the last image. yes please! quinta witzel is photographed here by justin hollar for nylon march 2012. the chanel favorite was added courtesy of stylist james rosenthal. hair by martin-christopher harper and makeup by natasha smee. WOW! Hard to even imagine wearing those but to have my hair match? But enjoy be kept “up to date”.